Fox Hollow Loop is a short, interpretive hike near the Dickey Ridge Visitor Center that gives you glimpses of life on the mountain. This hike takes you past an old cemetery. Generations of Foxes are buried in this hollow. Below: The trail starts near the Dickey Ridge Visitor Center; The trailhead has a sign marking different hike options in the area. After we finished our hike to Lands Run Falls, we decided to add another hike – the Fox Hollow Loop. 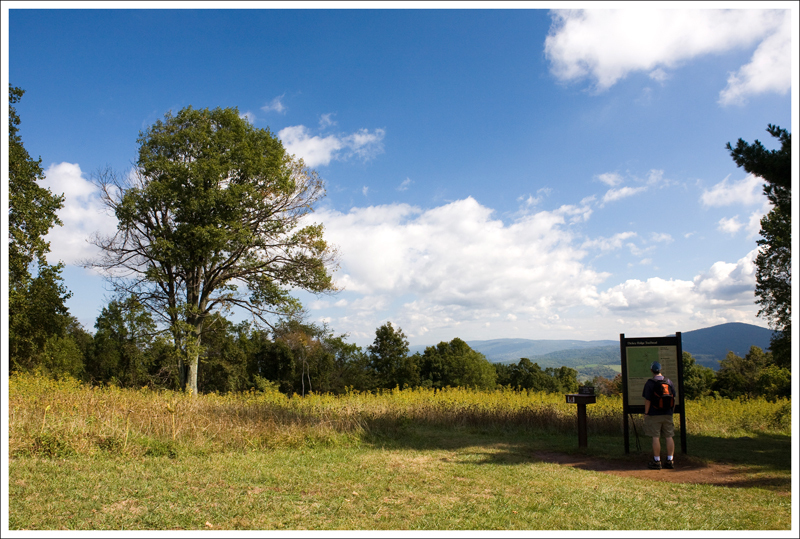 There is a path, starting near the flagpole, that takes you across Skyline Drive from the Dickey Ridge Visitor Center. You will see a plaque displaying the hike information and a box where you can purchase a $1 guide to to the hike. The guide is useful in helping you locate some of the interesting sights along the way. I would recommend picking this up since it does give a little history of the area and insight into the flora around you on the trail. From the sign, head to the left. You will quickly come up to a concrete post where the trail intersects with the blue-blazed Dickey Ridge Trail. Take a left at the post to join the Dickey Ridge Trail. At the next concrete post at .3 miles, you will take a right to join the no-blazed Fox Hollow Trail. The trail descends at this point as you go through the Fox homesite. You will shortly come across a few rockpiles, created by the Fox family to clear the cornfield. At .5 miles, you will reach the Fox family cemetery on the left of the trail. After leaving the cemetery, continue on the trail. Keep your eyes peeled for a millstone that is hidden in the brush on the side of the trail. It takes a sharp turn to the right and begins a climb up on a path that used to serve as a road used by the Fox family to get to Front Royal. At the one mile marker, you will reach another concrete post that intersects with the Dickey Ridge Trail. Continue straight past the post to reach the Visitor Center at 1.2 miles. The Fox Hollow Trail is well marked by cement posts. Below: The old box spring used to be the water supply for Dickey Ridge. This hike will attract many visitors as it is one of the first opportunities to hike if approaching from the Front Royal entrance to Shenandoah National Park. The short distance and mild elevation gain will also attract a lot of people. It is interesting to think of what life would be like for the Fox family. Thomas and Martha Fox started farming here in 1856 and the family stayed here until the 1930s. Most of the trees have been formed since the 1930s, so it is interesting to think of this area as plowed pastures for corn, wheat and bluegrass. The Fox Hollow Loop was the second hike we completed on our beautiful fall morning in the park. The hike started off with a nice view looking toward the valley to the east. The open meadow was blanketed with dry grasses and ragweed, so it looked golden under the fall sun. The trail quickly descended into the woods. The path was lined with dogwoods covered with their bright red seed berries. 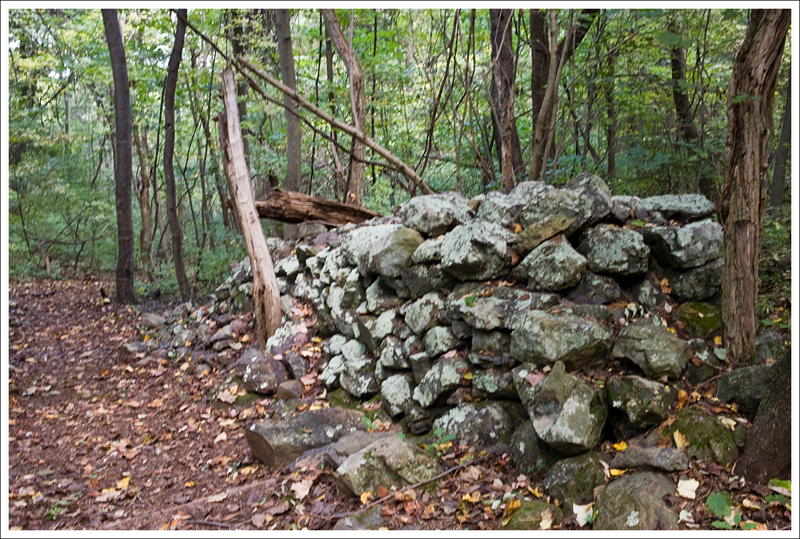 Along the trail, we saw piles of stones and old walls sinking back into the forest floor. There are many old stone walls in Fox Hollow. We soon passed an old cemetery, where generations of the Fox family have been buried. Most of the headstones have toppled or have disappeared, but two markers (Lemuel Fox and Gertrue Fox) are still in good shape. It’s compelling to imagine how different this hollow must have looked in 1900. Back then, this would have been open farmland – fields, cherry trees, barns, houses, stone walls and a road meandering over to the neighboring hollow. It must have been a lovely, idyllic place to live. 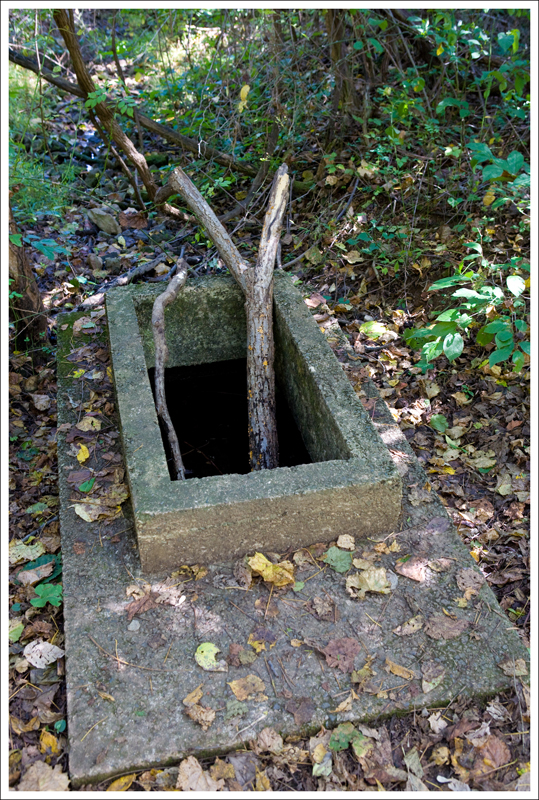 After leaving the cemetery, we continued downhill and found an old boxed spring. 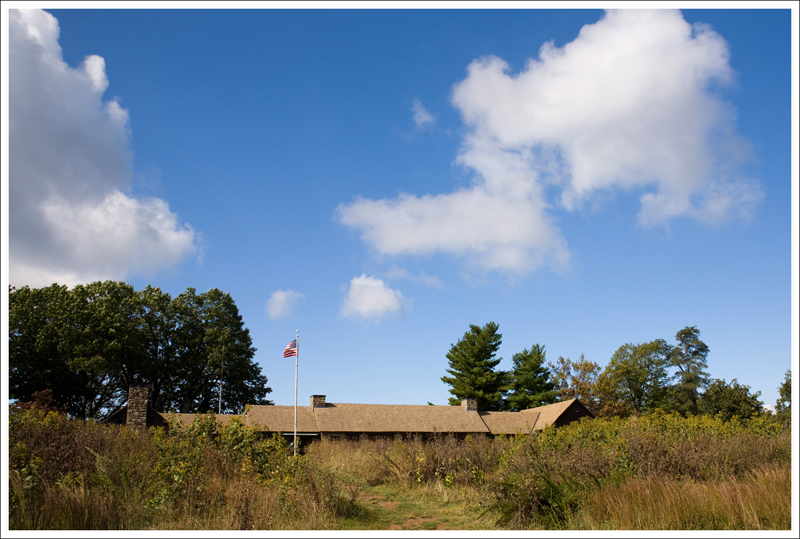 Apparently, when the park was new, this spring supplied water to the Dickey Ridge lodge. 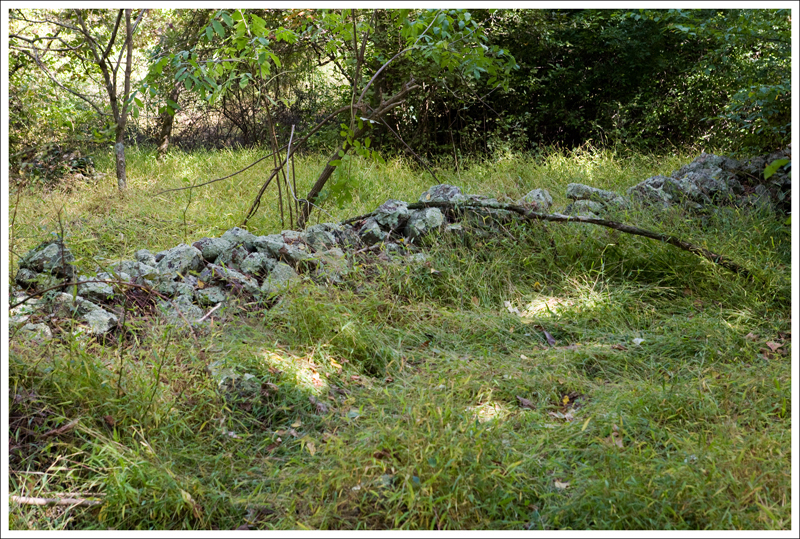 We passed over a small marshy area and saw more stone walls in an opening off the trail. There was supposed to a mill stone along the trail, but we never saw it. We also didn’t see the old barbed wire fencing that was supposedly along the trail. We weren’t the only hikers to miss spotting the artifacts. We ran into a group of four women standing in the middle of the trail. They asked if we had seen either the stone or fence. I think they were contemplating going back, but we pressed on. The rest of the trail was a nice walk through the woods and we soon came back to where we had started. Difficulty – 1. The trail should be quite easy for most people. Trail Conditions –4. The trail is well-maintained and easy to walk on. It could be muddy in parts after lots of rain. Views – 1.5. You do get some nice views from the plaque of mountains in the distance, but you won’t see much on the trail. Wildlife – 2. This is a busy trail, so many animals will stay away, but you may see deer around the area. The fields near the plaque would be good for bird watching. Ease to Navigate – 3.5. The trail only has a couple of turns near cement posts. If you read the directions on the posts, you shouldn’t have any problem. Solitude – 2. This is a popular trail for people of all abilities, so you will likely see others on the trail. Directions to trailhead: Follow Skyline Drive to the Dickey Ridge Visitors Center (around mile marker 4.6) Park at the visitors center. The trail begins on the east side of the drive, across from the center. 1) I love how Adam and Christine focused on different aspects of this trail: Adam wrote more on the logistics (start here, turn there, go through cemetery, etc) while Christine chose to write more about the details of the surroundings. Both approaches are very valuable, so it’s nice that you two could balance each other in the article. 2) looks like a pretty nice virtual family reunion going on in the comments! I have no family ties to the Shenandoah valley–I just love living here. Transplant from Maryland, but my family’s roots in Maryland don’t run very deep either. I am a descendant of William Fox who received numerous land grants in this area from 1792 until 1811. Does anyone know if the Fox family buried here are descendants of William Fox. Most of his grants were in what was then called Hampshire County. 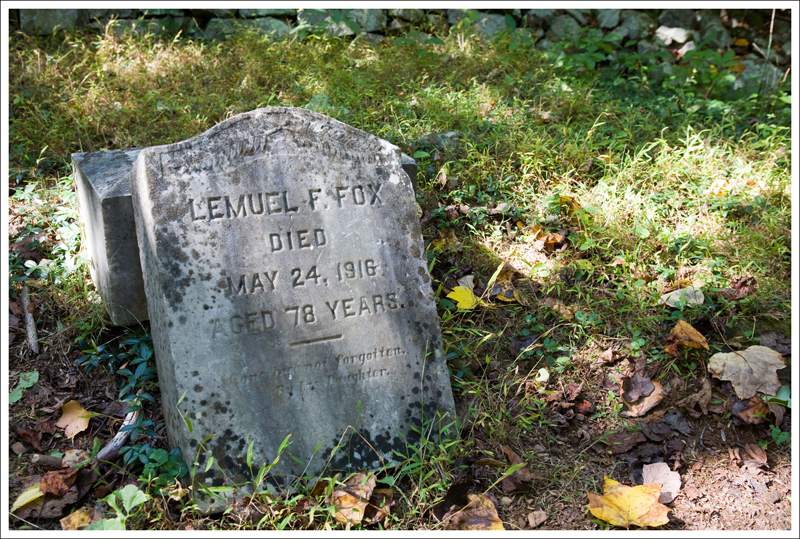 Lemuel F. Fox was also my Great Grandfather. My Grandfather was Ashby Colonel Fox and my mother was Betty Ann Fox Courtney. Cheryl Fox-Wyrick my mother used to talk about an Uncle Winnie – I imagine that was your grandfather. My Grandfather Ashby Colonel Fox had 11 children – Howard, Vernon, Frederick, Arthur, Ashby, Calvin, Robert, Lucille Fox St. Cyr, Lorraine Fox Painter, Betty Ann Fox Courtney and Kenneth Reynolds. Lemuel F. Fox was my husband’s Great Grandfather, his Grandfather was Ashby Colonel Fox, and his father was Howard Colonel Fox. Would love to get in touch with cousins, or other relatives and share stories, family histories, and photos. My name is Jani Fox and my husband is Roy Fox we live in Massachusetts. My great great grandfather was Lemuel Fox Senior. I believe Lemuel Fox, Jr. changed his name to Foxx. Does any one know why and where the Fox family originated from? I love we have this cemetery to commemorate our families, but it is sad if they were forced to leave park. It is beautiful area! Lemuel Franklin Fox was my Great Grandfather. Then the Jr you are referring to was Lemuel James Fox Sr Lemuel Franklin’s Grandson he had a son and named him Jr. Lemuel Franklin had a son and I’m thinking his name was John that moved up north after the Civil War and changed the spelling to Foxx. I don’t have any information, but hopefully someone will see this and contact you! My great aunt Georgianna Williams married Thomas Elzey Fox. They lived there and were forced to move to create the park. They then moved to Harmony Hollow. 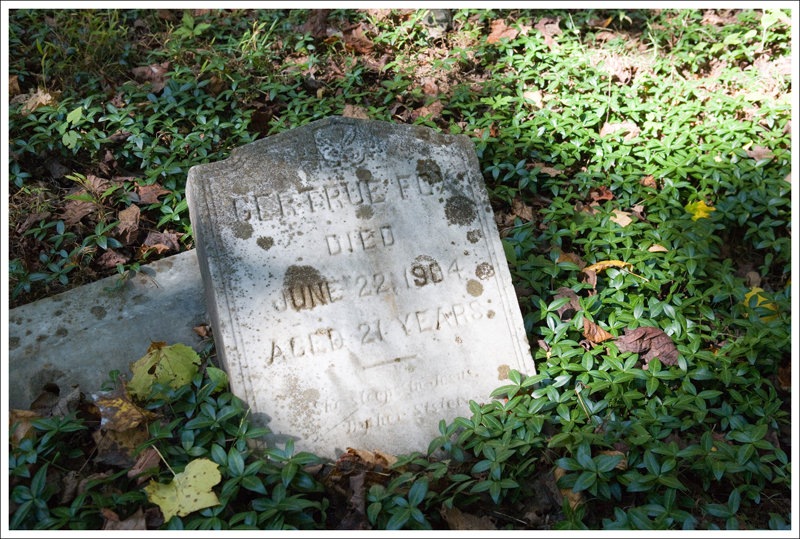 Georgianna was buried at the Fox cemetery, but was moved to Prospect Hill in the 1960’s. I am a decendant of Georgiana and Elzey! My great grandmother was Mamie Fox, their daughter. My grandfather was Ed Hickerson, who married Mamie’s dughter Edith Mills and he was also moved off the Park. I was raised in Harmony Hollow and still own the house and property up there. Chuck, Mamie Fox that married Samuel? Thanks for the visit, Victor! Thanks for posting the pictures of the trail. Lemuel F. Fox was my great grand father as well. Hello Cuz…Lemuel Franklin was my Great Grandfather as well. We went up last fall with the Sons of Confederacy and cleaned and repaired the headstones and cemetery. They volunteered their help since he fought in the Civil War and it looks beautiful!! We are planning on going up in the fall. My Name is Michael Stephen Fox and Lemuel F. Fox was my Great Grand Father. My Grand Father was Thomas Franklin Fox. My Father was Thomas Foley Fox. Very cool! 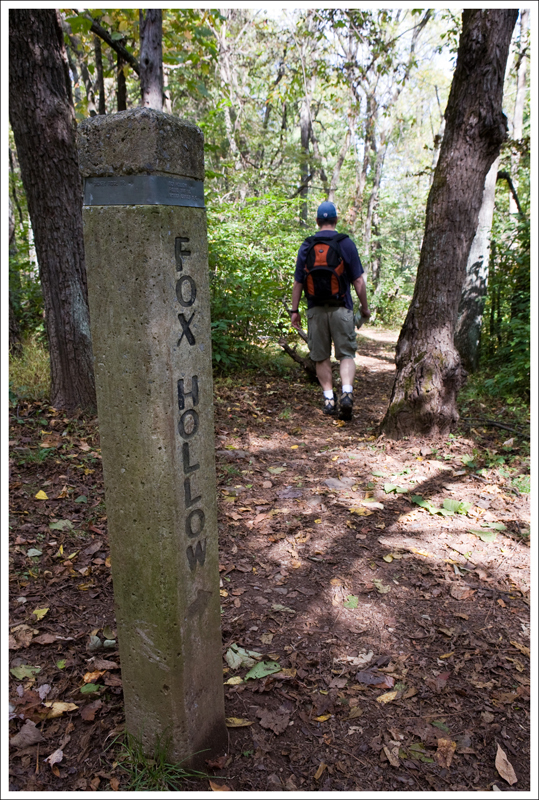 Have you ever been on the Fox Hollow hike? My father was Richard Franklin Fox. We went down last fall and cleaned up the cemetery and repaired the headstones with the help of The Sons of Confederacy. Lemuel and his 2 brothers fought in the Civil War so they volunteered their time. Thanks for this site.